Researchers at Stanford University have reworked CRISPR-Cas9 gene-editing technology to manipulate the genome in three-dimensional space, allowing them to ferry genetic snippets to different locations in a cell's nucleus. The new technique, dubbed CRISPR-genome organization or simply CRISPR-GO, uses a modified CRISPR protein to reorganize the genome in three dimensions. If CRISPR is like molecular scissors, then CRISPR-GO is like molecular tweezers, grabbing specific bits of the genome and plunking them down in new locations of the nucleus. But it's more than just physical relocation: Displacing genetic elements can change how they function. The research sheds new light on how the genome's spatial organization in the nucleus governs the function of the cell overall. "The question of why spatial organization in a cell matters is an important one, and it's also not one that scientists agree on," said Stanley Qi, Ph.D., assistant professor of bioengineering and of chemical and systems biology. "CRISPR-GO could provide an opportunity to answer that question by enabling us to target, move and relocate very specific stretches of DNA, and see how their new placements in the nucleus change how they function." Most mammalian cells contain a nucleus that houses more than 6 feet of DNA, if stretched out in a line. This genetic material determines the fate of the cells and, if out of place or damaged, can lead to disease. Previous studies have shown that DNA tends to clump in certain areas in the nucleus. How that placement affects the DNA's function, however, is still unclear. In the proof-of-principle study, Qi investigated three distinct subregions of the nucleus using CRISPR-GO, testing an overarching hypothesis: Do genes and other genetic elements behave differently in different zones of the nucleus? So far, their data show that specific compartments and some free-floating bodies of proteins in the nucleus can sway the function of repositioned DNA. Depending on where the genetic materials are located, some nuclear regions repress gene expression and some accelerate telomere growth, and subsequently cell division. One protein body may even hold the power to suppress tumor formation. A study detailing this research will be published online Oct. 11 in Cell. Qi is the senior author. Postdoctoral scholar Haifeng Wang, Ph.D., is the lead author. Demystifying the physical details of the genome has proved to be a tedious task, but there are some existing technologies that allow scientists to peer into cells and see how their guts are physically organized. What's been missing is a way to tamper with this organization. CRISPR-GO is the first to offer researchers a means to do so. 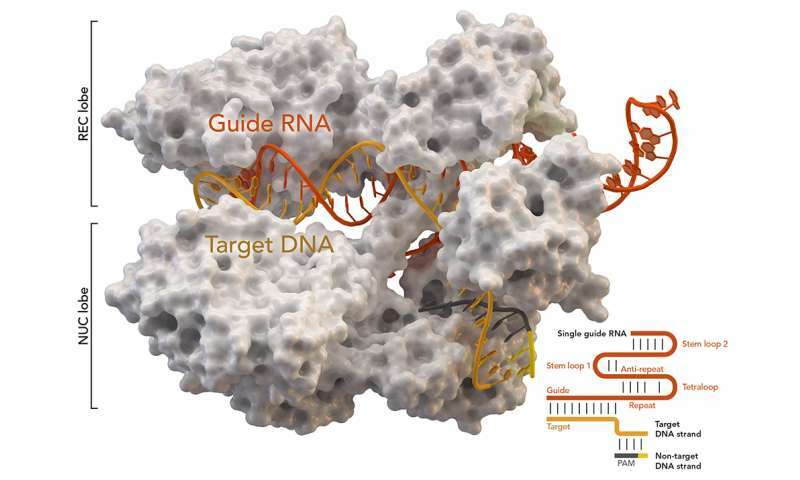 By decommissioning the "cutting" mechanism of CRISPR-Cas9, the editing tool becomes more of a delivery system, which Qi used to deliver small stretches of DNA via a programmable guide RNA to a new location in the nucleus. There are three essential parts of CRISPR-GO. First, there's what Qi calls the "address" of the genetic target that you want to relocate—a stretch of DNA that's targeted with a complementary strand of binding RNA. Then, you need the destination's address—the specific portion of DNA in a nuclear compartment to which you want to move the chromatin. Finally, there's the "bridge," which, in this case, is a catalyst that sparks the congealing of the target DNA to its new home in the nucleus. "Kids often like to build little railroads to help trains get from one station to another," said Qi. "It's not so different from what we're doing here." Qi describes the functionalities of the nuclear compartments like the spaces of a house. In every room of your home, you do different things—in the kitchen, you cook; in the bedroom, you sleep. In the nucleus of a cell, the same concept applies. There are multiple compartments in the nucleus that all have specific roles in upholding cell functionality overall. Qi and his lab investigated three distinct areas of the nucleus, testing whether they could somehow shift the function of chromatin depending on where they moved it. By using CRISPR-GO, the researchers observed that genes relocated to a part of the nucleus called the Cajal body, an amorphic and somewhat mysterious blob of proteins and RNA, stopped expressing proteins. "We were super-excited to see this; it's the first time that researchers have evidence to show the Cajal body can have a direct gene-regulation effect, in this case repressing gene expression," Qi said. "It suggests that the Cajal body has some unexpected role in controlling transcription." That could be big, as transcription is an important process that synthesizes the "code" for protein production. When Qi used CRISPR-GO to move the DNA of telomeres—the molecular caps of chromosomes that are associated with longevity—from the middle to the edge of the nucleus, the telomeres stopped growing, halting the cell cycle and reducing cell viability. The opposite, however, happened when telomeres were moved closer to the Cajal body: They grew and, in doing so, increased cell viability. The third application used CRISPR-GO to form a promyelocytic leukemia body. This glob of proteins is known to suppress pro-tumor genes. By positioning it next to cancer-causing genes in the nucleus, Qi plans to test if it can help curb tumor formation. "Another unique advantage of CRISPR-GO is that we can track the interactions between chromatin DNA and nuclear compartments in real time under a microscope," Wang said. While the evidence shown by CRISPR-GO is exciting, the research is still in a pilot stage, and there's more work to be done before the findings can be confirmed, Qi said. "We're very excited about the potential here and, while we've answered a couple questions, we've opened up about 20 more," Qi said. It will be even more important to decipher why these location-based effects take place in specific nuclear compartments, and what the underlying cause is, he said. One day, Qi hopes, this line of research will come to bear on human health.